What Day Of The Week Was January 26? 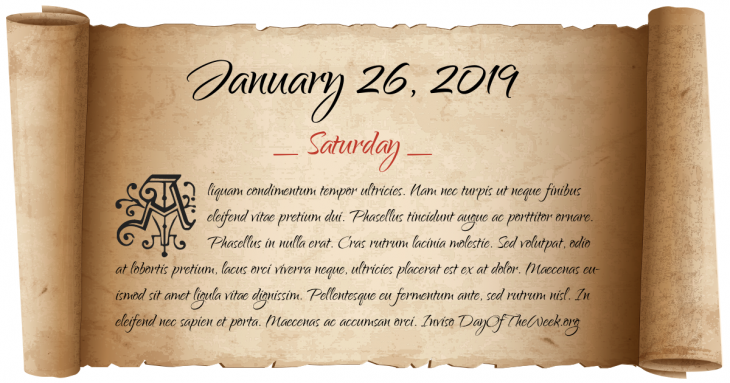 January 26, 2019 was the 26th day of the year 2019 in the Gregorian calendar. There were 339 days remaining until the end of the year. The day of the week was Saturday. Point No Point Treaty is signed in Washington Territory. American Civil War: Governor of Massachusetts John Albion Andrew receives permission from Secretary of War to raise a militia organization for men of African descent. The Short Magazine Lee-Enfield Mk III is officially introduced into British Military Service, and remains the second oldest military rifle still in official use. New Year’s Day in Chinese calendar. Start of the year of the Wood Tiger in Chinese astrology. Finnish Civil War: A group of Red Guards hangs a red lantern atop the tower of Helsinki Workers’ Hall to symbolically mark the start of the war. The Apollo Theater reopens in Harlem, New York City. Who were born on January 26?